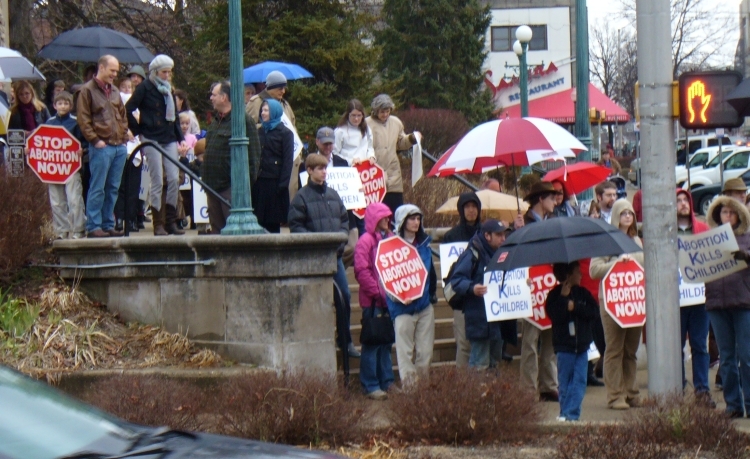 Over 200 people gathered at the Monroe County Courthouse on a rainy January afternoon to sadly remember the 1973 Supreme Court decision that threw out state laws against the killing of unborn children and to protest the continuing slaughter of unborn children in Bloomington and around the nation. 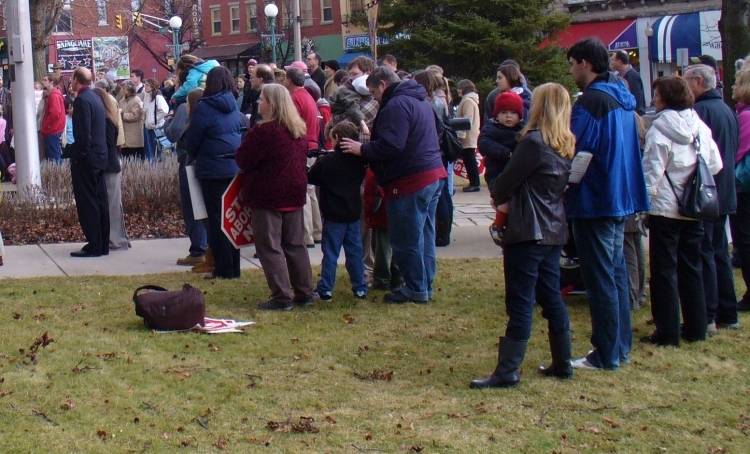 The rally was organized by Christian Citizens for Life, an alliance of Monroe County churches committed to oppose abortion and advocate for a life-affirming culture. In his opening remarks, CCFL publicity officer David Talcott reminded the crowd why we are here: that 50 million children have been killed by abortion since 1973, a procedure carried out under the protection of federal law. Talcott pointed to another grim statistic: the large number of abortions per capita in Monroe County. There were 676 abortions in 2005, and 1309 live births. It was even worse in 2004, with 775 abortions and 1273 live births. What this means is that we have an incredible tragedy going on right under our noses while many people look the other way. Even worse, our city and county governments have given the tax money they have confiscated by force from our pockets to an abortion clinic that kills babies made in the image of God each Thursday just a few blocks south of where we held the rally. The march through downtown was designed to pass in front of Planned Parenthood to remind us of the atrocities committed and the precious lives ended in that damnable building. It's difficult to wrap your brain around the sheer number of lives lost to abortion. But those of us who recognize that abortion is murder need to ask ourselves, in the face of what can only be described as genocide, are we doing enough? What can we do to fight against our depraved culture's view of human life as disposable? 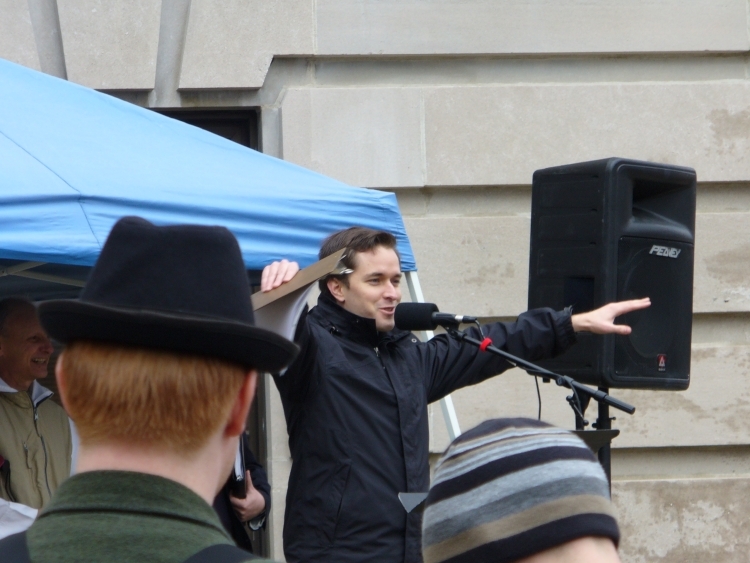 David Talcott of Christian Citizens for Life opens the event. 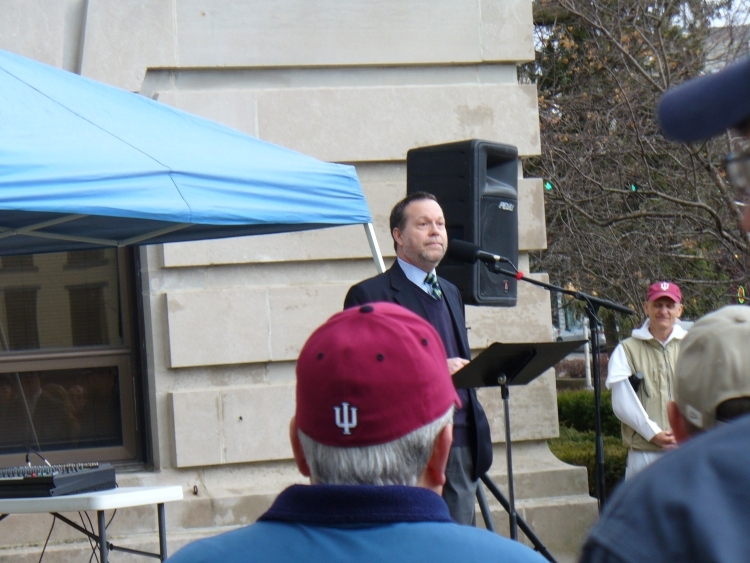 Roger Clark, Executive Pastor at Sherwood Oaks Christian Church, gives the keynote address. 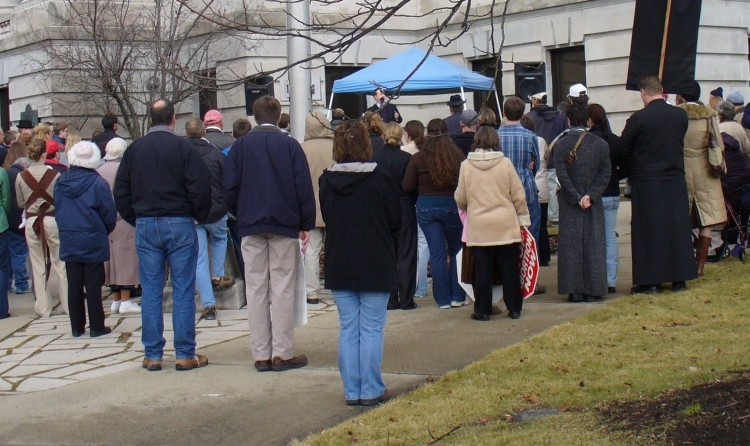 Abortion opponents listen to Pastor Clark. 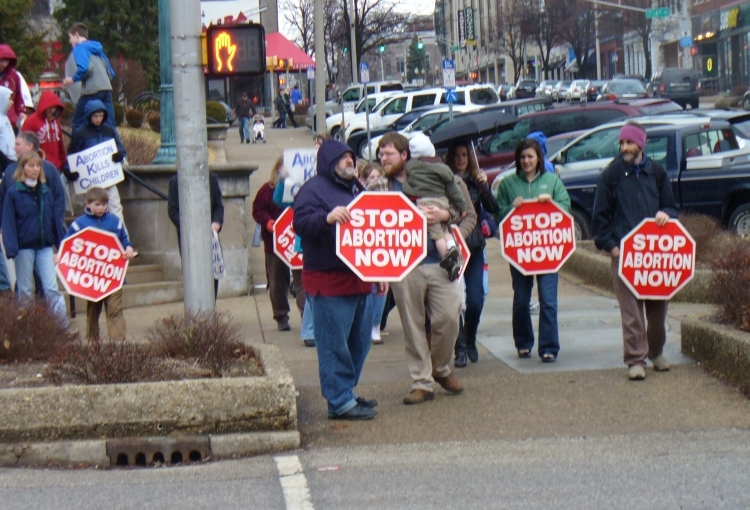 Abortion opponents prepare to march through downtown Bloomington. Waiting for the "walk" signal. 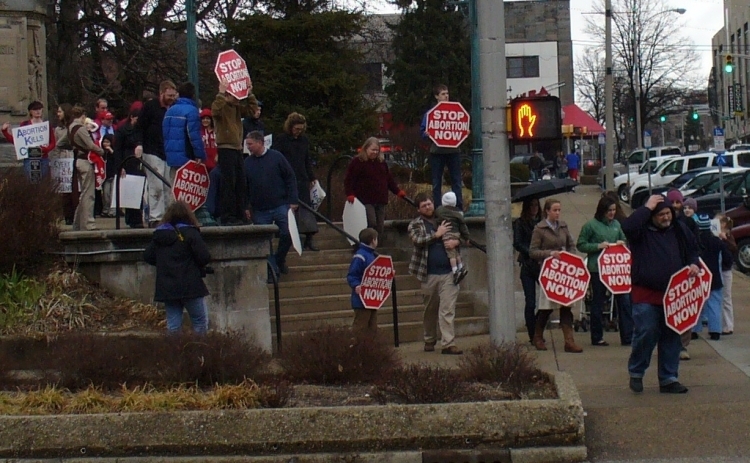 More abortion opponents begin the walk through Bloomington.